Participation is restricted to males only, there is no specific age for when one should start practicing and generally boys learn the activity while they are heading the cattle. This provides an opportunity for them to fight their way up to the position of leadership among other herders. Young boys learn this by observing and imitation. The boys also use the opportunity to sharpen their skills. At this stage they use small tree shrubs instead of real sticks. Real sticks are allowed, but when they are used; the fighters avoid hitting each other’s heads. [v] Following this stage young men graduate and participate in public ceremonies such as social gatherings (inter-district stick fighting competitions) and weddings. 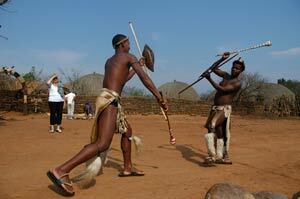 Fighters and their sticks are usually ritually prepared using traditional medicine prepared by a herbalist. [vi] The fights are officiated either by Induna yenzinsizwa (headmen of young men also referred to as igoso; or umphathi wezinsizwa (war captains) officials who ensure that things do not get out of hand. Before the fight begins two fighters face each other and tap one another’s shield or sticks. This is viewed as fair sportsmanship. In other instances this rule is not followed as the stick fighters launch the fight by landing chopping blows. These blows are dangerous as they are meant to overpower the opponent, resulting in serious injuries. Some of these injuries or permanent marks assume added importance as they are viewed as badges of honour, the most highly recognized being a scar on the head which is known as inkamb’ beyibuza (wherever you go people ask what’s that from? ).